Venice's famous Bridge of Sighs (Ponte dei Sospiri) was designed by Antonio Contino and was built at the beginning of the 17th century. Spanning the Rio di Palazzo (Palace River), the bridge was intended to connect the Old Prison and interrogation rooms in the Doge's Palace to the New Prison, which was situated directly across the canal. There are a few theories as to how the bridge got its name. The first one involves the prisoners that walked across the bridge on their way to the executioner. The prisoners would "sigh" as they crossed the bridge, probably catching their last glimpse of the outside world, many believed. Even though by the time the bridge was built summary executions at the hands of the inquisitors had ceased, many prisoners probably did cross the bridge and may have not seen freedom again... at least not for many years. Another story says that if a couple kisses under the bridge while drifting below on a gondola at sunset, they will enjoy eternal love. Thus, the "sighs" are said to come from lovers who are overwhelmed by the romance of the whole scene. This romantic view was created by the Poet Lord Byron with his writings: "I stood in Venice on the Bridge of Sighs, a palace and prison on each hand". 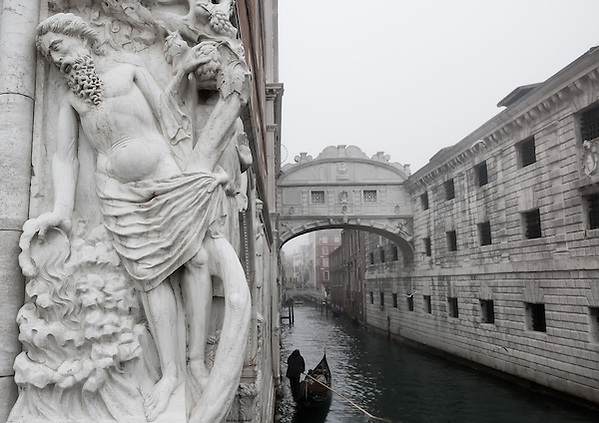 Indeed, the Bridge of Sighs is a beautiful sight, stretching high above the canal. It is generally known as one of the finest examples of bridge architecture in the world. Italian Renaissance in style, the 11m (36ft) wide bridge is made of white limestone and on the bridge two windows with stone bars sit at the summit of the enclosed bridge. The bridge took about two years to complete, with construction starting in 1600. Be sure to notice the many sculptures - most of them depicting sad or angry faces - as you cross under the bridge on a gondola ride.